Samsung Galaxy S4 zoom review: Lights, Camera, Android! 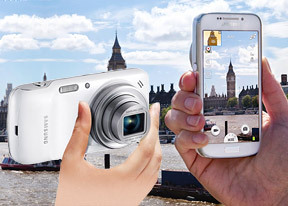 Having cornered the Android smartphone market, Samsung now has smart cameras in its sights. The Samsung Galaxy S4 zoom is a crossover of an Android phone and a point-and-shoot camera, trying to put the best of both worlds in your pocket. It's a lot more compact than last year's Galaxy Camera and this year's Galaxy NX and, unlike both of them, it has full telephony features. So, it has the makings of a midrange Android smartphone but adds a big sensor, xenon flash, Optical Image Stabilization (OIS) and 10x zoom. These things are usually well out of the reach of a smartphone, which needs to be thin. Thin the Galaxy S4 zoom isn't, but it's got other virtues. It's like a Galaxy S4 mini and a point-and-shoot camera had a teleportation accident and merged together. Of course, the chipset is a bit older than what the mini has, but still benchmarks well enough. The Zoom even kept the IR blaster. It used to be that people took a few dozen photos a year. Now they will do the same in a day or two and share them with the world in an instant. And all that thanks to the ever-improving photography skills of phones. The Samsung Galaxy S4 zoom takes this trend to an extreme - its long zoom, OIS and capable flash keep it relevant where a phone would be all but useless. Combining two gadgets in one has its advantages - you only have to carry one device. You're buying only one device too. But just how good is the Samsung Galaxy S4 zoom at being both a phone and a camera? Read on and find out.